Venezuela celebrates two holidays on July 24. The first one is Simón Bolívar Day, and the second one is Navy Day. This holiday honors the Battle of Lake Maracaibo, that took place in 1823. The Battle of Lake Maracaibo was fought on the Lake Maracaibo in Venezuela. This battle is often called the Naval Battle of the Lake. Its sides were Republican fleet under command of Admiral José Prudencio Padilla (Gran Colombia) and Royal fleet under command of Captain Ángel Laborde (Spain). The battle was won by the Republican forces. The battle became the last one in the Venezuelan War of Independence. The Venezuelan fleet was part of the armed forces of Gran Colombia, led by Simón Bolívar. The day of the Battle of Lake Maracaibo is observed on the territory of Venezuela as Navy Day. Battle of Lake Maracaibo Day is observed under its name only in the state of Zulia. 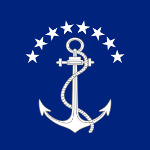 Bolivarian Navy of Venezuela is a part of the National Armed Forces. The navy serves to defend the naval sovereignty of the country and prevent illegal activities in the borders of Venezuela. The navy collaborates with international organizations to provide protection of international waters from criminal activities.